In this report, Persistence Market Research (PMR) offers a 10-year forecast of the global Shoe care market between 2017 and 2025. In terms of value, the market is expected to expand at a CAGR of 4.2% over the forecast period. The current study reveals the market trends and market dynamics in all seven regions that are expected to positively affect the current market environment and future scenario of the Shoe care Market over the forecast period. This Persistence Market Research report inspects the shoe care market for the period 2017–2025. The prime objective of this report is to offer insights into developments in the shoe care market that are gradually helping transform global businesses associated with the same. The global shoe care market report begins by the executive summary and defining various categories and their share in the shoe care market. It is followed by market dynamics, overview of the global shoe care market, which includes PMR analysis of market drivers, restraints, opportunities and trends that are affecting growth of the shoe care market. Furthermore, to understand the popularity of the market segment and regions, the attractiveness index with elaborated insights on the same is provided, which will show the market’s attractiveness based on the factors such as CAGR and incremental opportunity. The key driving factors of global shoe care market are increasing internet retailing along with growing demand of sports footwear due to growing health concerns among consumers globally. Increasing technological advancement in shoes and increasing preference of casual shoes are the major factor which drives the shoe care market, owing to growing fashion awareness among consumers across the globe. Other key factors which drive the global shoe care market are significantly increasing Innovation/R&D pace and growing significant importance of orthopaedic shoes, owing to surge in the demand for shoes care products for medical shoes. The key trends such as high focus on marketing strategies by key manufacturers, innovation in shoe products along with growing demand of leather shoes among consumers. The key restraining factors of global shoe care market are rapidly changing consumer’s preferences, increasing use of low scale shoes which may hinder the market to grow over the forecasted period. Additionally, other factors which restricts the global shoe care market to grow are high cost on shoe care products along with government regulations related to export and import of shoe care products across the globe. The market is segmented based on product type, sales channel type and region type. Based on product type, the market is sub-segmented into shoe care, shoe clean and shoe care accessories. Among all the product type, shoe care segment is expected to account for the highest market share, followed by shoe clean over the forecast period. Shoe care segment is expected to grow with a CAGR of 4.3% during the forecast period in terms of value. Shoe care accessories is estimated to register a CAGR of 3.7% in the global shoe care market over the forecast period. The factors fuelling demand for global shoe care market are incessantly growing footwear market and increasing demand for advance comfort across the globe due to growing innovation in shoes along with rapidly changing the demand pattern among consumers. Another segmentation of the global shoe care market is done on the basis of sales channel type such as exclusive, hypermarket and online. Among all the mentioned sales channel type, online segment is estimated to account highest market share in the global shoe care market followed by exclusive segment by end of 2025. The next section of the report highlights the shoe care adoption, by region, and provides the market outlook for 2017–2027. The study investigates the market attractiveness regionally, as well as analyses the limit to which the drivers are influencing the shoe care market in each region. Main regions assessed in this report include North America, Latin America, Europe, Asia Pacific (APAC), and the Middle East & Africa (MEA). The sections, by product type and sales channel type evaluate the present scenario and growth prospects of the regional shoe care market for 2017–2027. Increasing focus of global key players for expansion in North America and Europe region is expected to increase the shoe care market share in these regions. Collectively, Europe and North America markets are expected to account for over 63.9% revenue share of the global shoe care market by 2015 end. Among the emerging markets, APAC is estimated to exhibit a significant CAGR of 5.1% over the forecast period, followed by Latin America market with a CAGR of 4.6%, due to the growing population, disposable income along with high adoption of fancy and trendy shoes among consumers. To ascertain the shoe care market size, we have also taken into account the revenue generated by the various manufacturers. The forecast presented here assesses the total revenue generated by value, across the Shoe care market. In order to provide an accurate forecast, we initiated by sizing up the current market, which forms the basis on how the Shoe care market is expected to develop in the future. Given the characteristics of the market, we triangulated the outcome on the basis of three different types of analysis; based on supply side, downstream industry demand and the economic envelope. In addition, it is imperative to note that in an ever-fluctuating global economy, we not only conduct forecasts in terms of CAGR, but also analyse the market based on key parameters, such as year-on-year (Y-o-Y) growth rates, to understand the predictability of the Shoe care market and identify the right opportunities across the market. The shoe care segments, by product type, by sales channel type and region, have been analysed in terms of basis point share (BPS) to understand the individual segment’s relative contributions to market growth. This detailed level of information is important for identifying various key trends in the Shoe care market. Another key feature of this report is the analysis of key segments in terms of absolute dollar opportunity. This is overlooked while forecasting the market. However, absolute dollar opportunity is critical for evaluating the scope of opportunity that a provider can look to achieve, as well as to identify potential resources from a delivery perspective of the shoe care market. The overall absolute dollar opportunity along with the segmental split is mentioned in the report. 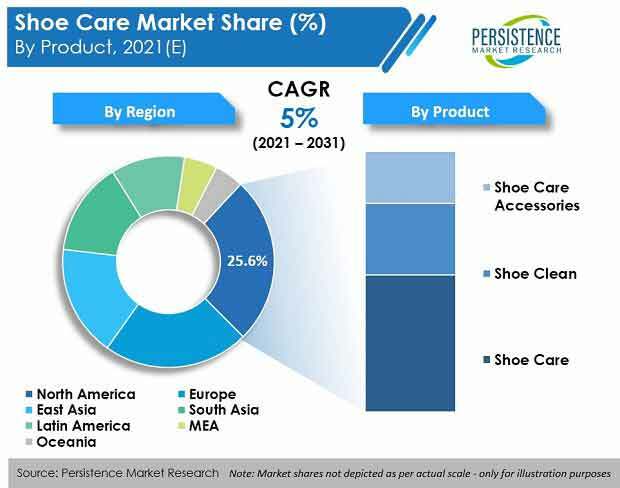 To understand key growth segments in terms of growth and adoption for shoe care globally, Persistence Market Research developed the shoe care market ‘Attractiveness Index.’ The resulting index should help providers identify real market opportunities. In the final section of the report on shoe care, the ‘dashboard view’ of the companies is provided to compare the current industrial scenario and their contribution in total shoe care market. Moreover, it is primarily designed to provide clients with an objective and detailed comparative assessment of key manufacturers specific to a market segment. Report audiences can gain segment-specific developers insights to identify and evaluate key competitors based on the in-depth assessment of their capabilities and success in the shoe care marketplace. Detailed profiles of shoe care manufacturing companies are also included in the report to evaluate their long– and short–term strategies, key product offerings and recent developments in the shoe care market. Key market competitors covered in the report include S.C. Johnson & Son, Inc, Payless Holdings, Allen Edmonds Corporation, Shinola LLC, Penguin Brands Inc., Charles Clinkard group Salzenbrodt GmbH & Co. KG, Salamander Gmbh, U.S. Continental Marketing Inc.
Shoe care includes the products such as cream, polish, spray, brushes etc which are used to maintain footwear. Shoe care products are used for various applications such as formal shoes, casual shoes, sports shoes and others. Additionally, shoe care products comes in many types include shoe care, shoe clean and shoe care accessories which keep shoes new looking as well as shiny. The global shoe care market is expected to grow at a CAGR of 4.2% during the forecast period, and is expected to be valued at US$ 6,097 Mn by 2025, from US$ 4,389 Mn in 2017 owing to the factors such as increasing demand of formal shoes among working women and increasing internet retailing. In this report, the global shoe care market has been segmented into five major regions, namely North America, Latin America, Europe, Asia Pacific (APAC) and the Middle East & Africa (MEA). North America is expected to be the most favourable region in terms of absolute opportunities lying ahead for high revenue generation. North America is estimated to maintain its dominance in the global Shoe care market with 36.5% market value share in 2017, followed by Europe.